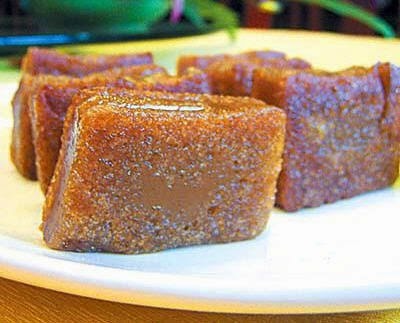 年糕, or New Year's Rice Cake, was traditionally home-made, Tamsui was no exception. It was a big deal that often required the efforts of women folks of the whole household. The final products came in two flavors, salty and sweet. Each slab measured 3x3 feet and 4 fingers thick. In the winter cold, they last a long long time. You could cut off a little slice and roast it over a hibachi. Ideal snack in the winter time. To make the cakes, first, sweet/sticky rice was soaked in water overnight. 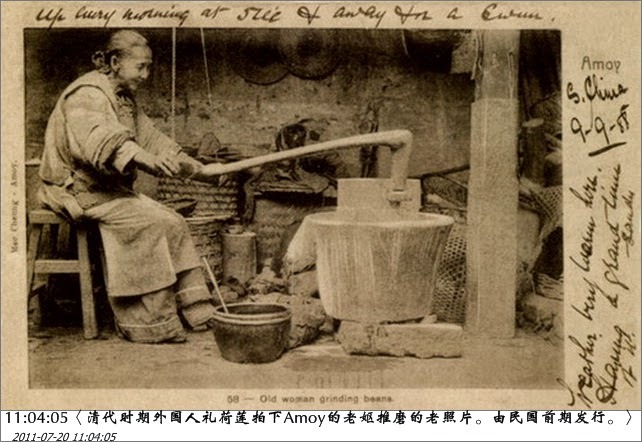 Then came the most labor-intensive part, the grinding, using a 磨 or a two-piece round stone mill with one on top of the other. The larger one at the bottom had an open circular groove carved out with the inner diameter matching the diameter of the top one. 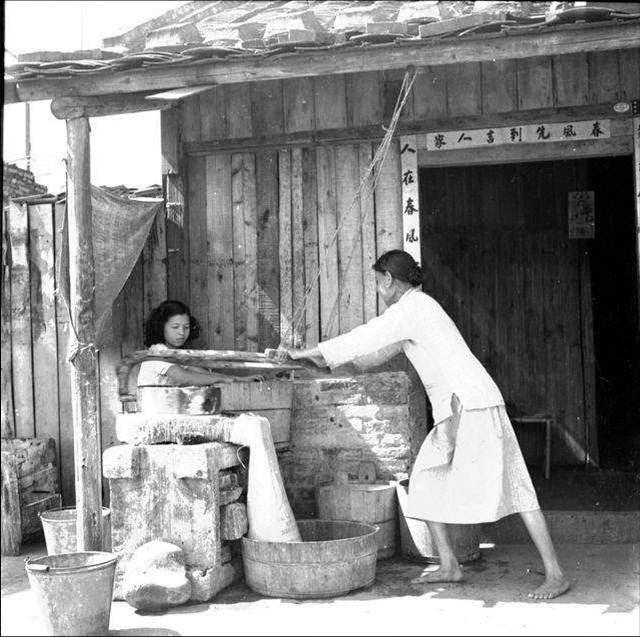 For efficiency, usually a woman did the circular pushing and a girl ladled rice-water mixture into a hole at the top portion of the millstone, rice was then crushed between the two stones. Photo by 礼荷莲 （Lilias Graham） taken in 1893 in 鼓浪屿, Amoy. The rice slurry was collected through the circular groove and spouted into a flour sac (for its fine meshes), and the opening of the sac tied. It was then laid onto a long wooden bench and a long bamboo pole put on top with both ends tied down to squeeze out the water. The resulting rice-dough was further flavored with sugar or salt (plus other ingredients if desired). The mix was then loaded into a square mold and steamed in a huge wooden/bamboo steamer until done. During Lunar New Year, not only rice cakes were made, a whole lot of dishes, of chicken, duck, fish, and pork, were also prepared for a New Year's Eve feast. And New Year's Day was, still is, when kids go around collecting red envelops (紅包, with real money inside!) from all family members.